I have received a number of requests from different places to help folks with brush installation in Painter 12. I have a video for the subject in my class Painter 12, a New Beginning. I have decided to post that here to help folks with brush installation. Painter 12.1 has changed the way brush management works significantly. This video recommends installing brushes in what I refer to as the Applications Area, which we had to do for Painter 12 and Painter 12 with SP-1. Now, I would recommend installing in the User Area. I have a new page, Brush Management for Painter 12.1 that is specific to the changes in 12.1. If you are not upgrading, then this page has the information that you need. I highly recommend that everyone upgade to Painter 12.1. You will also learn about brush libraries and why you need them. One of the problems that is occurring has to do with a problem in the software. Normally, I would suggest loading brushes in the user area, but the software will ultimately think the brush category is empty. So, in this video, I am showing how to load in the application area. If this changes in a later patch, I’ll change the video. If you have questions, please let me know. I downloaded the brushes. I have a mac and I can see them under brushes in the application. I cannot seem to get them to load into the brushes. Do I need to do programming as you did? I do not know how to do that. No, you do not need to open painter the way I did from the c: prompt. When I did the video, the SP1 patch was not out and I was trying to tell painter how many cores it could use. I probably should do the video over again. Please ignore the way I opened Painter. But, based on what you have said, I believe that you have loaded the brushes incorrectly, but I’m not sure. It is very helpful when asking a question that you give me more information than less. You tell me you can see the downloaded brushes under brushes in the application, which is good information, but best information would be to give me the whole path and not just pieces of it. The path is Applications > Corel Painter 12 > Brushes and if I understand it correctly, you put the downloaded files here, right? If so, that isn’t correct. Painter would think that the Brush category folder would be a library and not a brush category folder. Your path should look like this: Applications > Corel Painter 12 > Brushes > Cool Spring (that would be the library name) > Cool Spring folder with the companion jpg. Now open Painter and go to the Brush Selector Bar and open the Brush Library Panel. Click on its Option Button and go to bush library. Look for Cool Spring in the list and select it. The Cool Spring library will open and the Cool Spring category will show plus the variants. Thanks for your prompt reply. I followed your dialogue and the only library that shows and has continued to show is soft water. I have taken a screen capture which would show you precisely my progression but I do not know how to get that to you. I sent you my email and we can finish our conversation through emails. So ? could you solve the problem for Mac users ? In the video I discuss the paths to use for MACs, so I am unsure of your question. If you can tell me the specific problem you are having, I’ll see if I can give you an answer. I just recently took the plunge and bought an iMac plus Painter 12 last month. So, I’ve had a lot to digest during the past several weeks as I’ve been running on an old HP Widows for the past decade. My path was HD>Applications>Corel Painter 12>Brushes. The title that I gave for that new folder is still appearing in my Brush Library window. It does not appear anywhere on my iMac. I even did a thorough Finder search. As far as my iMac is concerned, it is deleted, gone. But apparently Painter 12 thinks otherwise. How can I delete this title from the brush library? It’s as if Painter does not recognize that iMac deleted the library folder. The other thing I wanted to inquire about is that I had downloaded Nature Water . I believe I did that first and then came over to visit your site. I had moved that brush folder category and jpg icon into Painter12. But would you believe….I actually have Nature Water appearing as a Library in my Brush Library window! It isn’t there in my city of Brushes. If the whole downloaded folder was first moved over there, I may have noticed that it was labeled P12 and decided to just take the NatureWater folder and jpg icon and move it into the neighborhood of Painter 12 Brushes and delete the title folder P12 Nature Water from the main Brushes area. But Nature Water is located in Painter 12 Brush folder, so I don’t understand why there appears that title in the Brush Library. This doesn’t make any sense to me. I don’t want to appear long winded, but I’m still interested in learning from you and Karen. I realize that I’ve missed the class that has just started, but maybe it’s just as well until I’m more confidant with what I’m doing here. How exciting to get a new computer. I know you will love it, but there is always that initial set up time that can be frustrating. About your questions, I think the solution to them both is the same. If I am understanding you correctly, you deleted the library files or moved them from the brushes folder. That is good. But, Painter also writes an identical library in the user area and places any changes you make in the identical library. The new MAC OS has a different path, I think. Here is the path that I know works for the older OS. You would follow this path and delete Nature Water and Splashing Water under the Brushes Folder. Like I said, this may not be the path for your particular OS. If it isn’t, please let me know what OS you are using and I will try to find out what path you do use. Thank you! I bought the OS Snow Leopard then downloaded my free upgrade of OS X Lion. I did not know to check out this path going to the Library. I was just going to Applications; not the Library route. So I did as you said. There is no Corel or Painter 12 folder listed. Now I am disturbed! How can I learn to make or move brush libraries? What would happen if I loaded those extra libraries that came with Painter 12 and I didn’t want them all in my Library Window? I would not be able to get rid of those titles even though I moved the libraries out of there. The problem is with your OS X Lion. For some reasons Apple decided to hide the files. Here are two articles that should help you. If these two articles do not help, you will need to contact Apple support and ask them to help you. Once you are able to get to the files, then you will be able to delete the user libraries of Cool Spring and Nature Water. Skip, thanks for your informative videos. Once clarification is needed. It is not the drive letter for the OS but the drive letter where Painter was installed. For example, I have partitions and store most programs on my D: drive, so that is where the Brush library is located D:/Program files/Corel/Painter12/Brushes in my example. You are absolutely correct. Thank you so much for taking the time to make that clarification. Gosh, I hope folks that partition their drive or drives will know the path is dependent upon where Painter is loaded. I don’t think I have ever discussed this issue before. Thanks again for posting and helping out. Hot dog! I went to the first link you gave me. After reading I took the challenge and here’s how it worked for me. This will give you access to your Library folder. This is just the beginning. Now, if I go through the HD>Library>Applications Support a Corel folder still does not exist; just as before! My Adobe folder has always existed there and I still couldn’t understand why I was not able to see a Corel folder. Then it dawned on me. I bought CS5 for Mac. So that was specifically written for Mac., but Painter is written to use for either Windows or Mac. So somewhere along the line this may need to be corrected in the future so Mac users don’t have this problem under the HD area. Or, Painter needs to run a line in so that the Administrator has access to the Corel folder in the HD area Library. Ok now, here’s something else. I was not able to access through the All Files area as suggested in this link tutorial. But I was able to access my Library folder where everything opened up now through my User area marked Home with the little house on it. It is HERE where you are able then to access the Library with the Corel folder! Even though I am the Admin and sole user of this machine, I can only have access to this Corel file folder under the Home area Not the HD area. I was able to then delete the 2 titles in my Brush Library. Home (where I’m considered a user)> Library>Application Support>Corel>Painter 12>Default>Brushes. I am a glutton for punishment and do want to redownload your brushes again, but not right now. This whole thing sorta wore me out. I still have Cool Spring and Happy Zen Raw 2 in my Documents area. The Happy Zen and Nature Water are loaded in my Painter 12 brush area and my Brush Library window is back the way it was when I first got Painter. Hope I can be a friend and call you Dianne. Thanks for the feedback. Did you try the second link? I’m no expert here but the above statement isn’t correct. There are two separate folders and two separate areas where the folders are kept. Basically, when you make a change to a brush…say an Acrylic brush…Painter records the changes in the “Home” area, or what I call the user area. PC users have a similar issue, we have to go and unhide folders as well, but once done, then we can access the user area as easily as the Applications area. I suspect that if you look at the Adobe files in the “Home” area, they will be different from the ones in the Applications area. But, I don’t have a MAC and this is speculation on my part. If you would like to follow up with this issue and tell it to the folks that count. :)…go to http://painterfactory.com/. This is Corel Painter official site and you can ask questions and post defects and ask for enhancements…bunches of stuff. It is where I found the two links I provided. It is a great place to find out everything you wanted to know about Corel Painter. Good luck with reinstalling the brushes. One more comment about brushes. When downloading a new brush, the folder and Icon are usually inside another folder. If you place the top container folder into the Brushes folder of Painter, it doesn’t recognize it. This has happened to me . Only the new Brush folder with its icon should be dragged and dropped into the Painter Brushes folder. Now this time I take issue with what you are saying…at least if I understand what you are saying. Brushes folder is the container for Libraries. Painter Brushes folder is a library. Libraries contain Brush Category folders and the companion jpg. That means that if you drop your brush category folder and the icon into Painter Brushes, it will show up in Painter Brushes Library. However, if you drop a Library folder that contains the Category folder and icon under Brushes, then you will not see the brushes in Painter Brushes, but will see them in the newly created library. To see those brushes in Painter 12, you would open the brush library panel and open the option button or fly out menu and select brush libraries and pick the new library. Now you will be able to see the brushes. I hope I understood what you said and this helps clear it up. Thank you very much for this tutorial… it really helped me a lot. I was searching for a tutorial on how to load brushes to Corel Painter 12 for ages, lol… thank god I found your blog… again – thank you soooo much!!! Thanks for dropping by and I am glad the information is helpful. Be sure that you go to the later post and review the new information for loading brushes with Painter 12.1. It has changed significantly from my first video on brushes. Thanks again for stopping by and posting a comment. I really appreciate it. After watching your video how to install brush lib. and the extra brushes that came with Painter 12, I was finally able to do it. Great…that is good news. Not everyone has had the same good fortune. Once we get use to the new way of loading brushes, we will love it. Hello i was i’ve been having trouble creating a library on a mac. You will find the companion jpgs under Painter 12 Brushes. Are you planning on creating a brush category and add your custom brushes to it? If so, you can create your own companion jpgs for your custom brush category, which can be fun. Can you tell me about your computer? What type, processor, RAM, Video Card…that sort of thing. The recommendation for Painter is the absolute bottom that the program will work. The brushes would lag a great deal, but the program still works. As hardware becomes faster and more powerful, so do the applications. Your Dell Latitude is also at the low end of computer power so slower brushes are expected. 3 GB of RAM is too little. And the processor is too slow. There are some settings that you can try, but I am pretty sure it will not help. You can go to Edit > Preferences > Performance and check your Multicore usage, Memory usage, and scratch drive. Yours will probably be set to 2 cores, 80% Memory, and the scratch drive is C. At that setting, Painter is using as much power that it can muster from your machine. Can you add more memory to your lap top? If you can, that would help. But before you go to the trouble of trying to improve your current lap top, you may want to consider buying a new one. Processor…at least a fast Intel i7 with 8 cores RAM…at least 16 GB. If you can afford a second drive that you can set up as a scratch drive…that will help, too. Video Cards are not as critical, but I would try to get the best one you can. The above is reasonable, but when I buy a new computer, I try to get the top of the line for processing, RAM, Video Card, etc. It means I have to have a fairly large budget, but the computer will last at least 5 years before I need a new one. A less powerful machine will need replacing every two years. My lap top is 3 years old and needs to be replaced. It was a Dell gaming lap top, so you would think that it was pretty good. It was for about a year…LOL. It performed very well. Now it is as slow as molasses and it is a more powerful machine than you have. I have it souped up as much as I can…so my only solution will be to buy a new lap top. I don’t need it right now, but the next time I travel, I will have to update the lap top so I can still keep in touch, do tutorials and live meetings. I may have to cancel any travel plans…sigh…keeping computers updated is expensive. Please, do not take all I have said as gospel. This is just my opinion. You can talk with Dell and tell them what you need and maybe they can help. I think there have been some comments at Painter Factory about suitable machine…but I may be wrong about that. The link to Painter Factory is in my blog roll. Do search for other opinions and then you can buy with an informed decision. Good luck…it is no fun shopping for a new computer…well it is fun once you get over worrying about paying for it…LOL. Thanks for dropping by and posting a question. I wish I could have answered it better for you. You are welcome Mai. I took a look at some of your drawings on Deviant Art…nicely done. Hi, I think if you will watch the video called Brush Management in Painter 12.1, all your questions will be answered. First let me say that I am jealous that you have been using Painter for so long and have talked to Mark Zimmer. Did you know that he has a wonderful blog? You must check it out. The blog is called Relativistic Observer. I love the blog and visit when he posts, which is pretty frequently. Your question is interesting. I don’t have Painter X installed, so I cannot test importing brushes that have been installed Painter X. Why not download the Painter 12 free trial. Once you have done that, you can test if the brushes can be used in Painter 12. I do have a video that explains taking a zip file of the Brush Folder and companion jpg, and changing the zip extension to .brushcategory or .brushlibrary, which then allows you to double click the file and it will automatically install in Painter 12. I am pretty sure it will work, but because I cannot test it, I cannot be certain. I don’t think you could take the brushes out of Painter 6 and install them, but if you have them in Painter X, that should make them compatible with Painter 12. Painter 12 comes with Extras, which include papers, patterns, weaves, brushes, etc. One of the brush categories is Painter 6 watercolor. I was able to install those into Painter 12. That is a good sign. Do try the free trial. Once you download it, check back with me if you have trouble understanding how to load the files. Do look at the video here: Brush Management, A Primer Then review Painter 12 Brush Extension video. I hope this helps. Please feel free to contact me after you have your free trial. Update: I think I found a way – I exported and imported my workspace into 12 and so far it looks like this will work. Although I am not sure how to access 12’s brushes, but that is OK.
That is good news for sure. To find Painter 12 brushes, go to your brush selector, it will open the brush drawer. At the top right corner of the brush drawer is an option button that will open a list of options. Look down the list for Brush Library. Select Brush Library and you will see all of the brush libraries that you currently have installed. One of them should be Painter Brushes, which should open Painter 12 Brushes. If it doesn’t, I may want to see a screen shot. Thanks for your reply, Skip! I actually did download the free trial right after I sent my first message and by importing the workspace I got most of what I need. So I bought the upgrade and I think everything is working well so far. Yes, Mark was a great person to know. Thanks for the blog link – I will definitely check it out. From Painter 3 to Paint 6 I would go for his kickoffs at MacWorld or Seibold Seminars, both at the Mascone Center in SF each year, and I can tell you it was not unusual for him to get a standing ovation from those of us that crowded the 30 chairs at the Fractal Design exhibition when he gave his hourly “What’s New in Painter _”. I never saw that at any other exhibitor’s booth, with the exception of Indigo the year they exhibited the world’s first digital offset printer. MacWorld and Seibold were like giant carnivals in those days. I was a traditional illustrator with a New York agent (Jerry Leff and Associates) but when I saw an article in Popular Photography about a program called Photoshop and a photo of red tulips with a watercolor filter run on it, I just knew it was time to explore the new digital frontier coming. So I researched platforms and decided on Apple (this was in 1993) and bought my first work station late that year (Quadra 950) which, with Wacom tablet, scanner, workstation, graphics card, Quark, PS 2.5, Painter 2.0, Syquest drives, etc, cost me $29,500. Kids today have no idea what they get for their money! Anyway, within weeks I was selling traditional looking art. One of the first jobs as a digital watercolor map of a new golf course for the Pebble Beach corporation. I was so green in Painter that I remember being horrified to discover the paper texture *after* sending off the watercolor file. It was great fun. Mark would ask us each year what we wanted to see in the next version and, of course, we were very happy to tell him. While technology continues to grow today, there was something really special about the pioneering revolution in desktop publishing in those days. The whole revolution was good for my wife and I (who is also a digital illustrator, having created more than 18,000 published color illustrations – kimjustinen.com) The excitement was palpable everywhere. 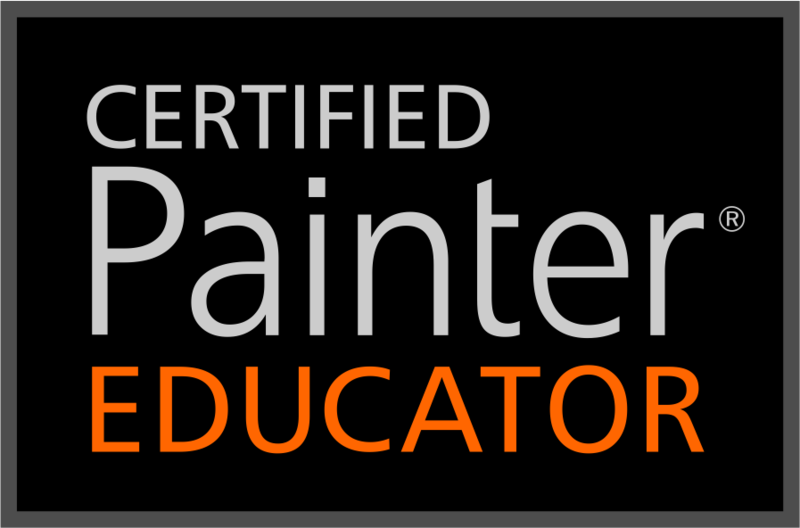 Over the years I’ve had the chance to teach Painter classes and workshops as an adjunct teacher in Washington State, Idaho, Tennessee, and a one week seminar in the Philippines. Out of our original business has grown GoodSalt.com, MemorialReflections.com, and jcg.com. When I was first sitting in bead with a bunch of computer magazines deciding what computer to buy in 1993, my wife was also sitting next to me reading baby books, expecting our first child. Next year Stephen heads to college! It’s been quite a journey! …. well, looks like it’s late and I got into a stream of consciousness response. Thanks again for your time. I’ve bookmarked you as a good source of help. Thanks, Skip! You have really been active in the early days of Painter. What a treat. I think you comment about the surprise from Mark…wow we didn’t see this coming…is normal for developers. They create incredible programs for us, but then we usually figure out how to use it to produce unexpected results…or unexpected by the developers. We love it…they love it…it is a win win for sure. I identify with sitting in bed reading computer magazines. I started doing that in the early 80s. On of my favorite publications was in a newspaper format, which I believe was called Info News…hmmm…seems like it would have computer in the name, but that isn’t what I am remembering…LOL…no telling what I was reading. Anyway, I didn’t have a computer, but had read something about personal computers that were beginning to be produced. My first computer, was kind of fun…it was a Commodore 64, which I won by sending in Alpo dog food containers. My dog helped. But after reading mags for over a year, I got serious about a new computer. I opted for a Compaq 8086 or maybe it was an 8088. Not sure. Seems like the next was a compaq 80186…shoot I am forgetting. I loved Compaq back then…so I bought stock…that turned out to be pretty successful. I think that first Compaq was purchase in 1984 or 85. I started working with Corel Draw…even have Corel Draw 1. Anyway…loved chatting with you and I do hope you get in touch with Mark…I don’t really know him, but I bet he would get a kick out of hearing from you. I really appreciate your willingness to help the world of Painter artists navigate the maze of possibilities within the powerful program. If karma exists, you deserve extra points! It seems I have the dilemma of many, and I apologize if this questions is redundant, but I wasn’t able to find here the specific information and solution to importing the Painter 12 Extras into Painter 12 on my MacBook Pro. I first consulted Corel and essentially was tossed by the wayside when they couldn’t provide anything more than there stock answer–which, of course, didn’t work. So, I have the Painter Extras folder from the DVD on my desktop–and even downloaded it from the web in case my DVD copy was corrupted. I followed the instructions Corel provided: Applications>Corel Painter 12>Brushes>Calligraphic Brushes (as an example–just trying to get at least one brush into the program; Corel’s instructions to simply copy the entire Painter Extras folder and paste it into the Painter 12 folder, to access all the extras, does nothing ). No luck, obviously. I’ve tried to import a single brush from within Painter 12, too, and get all the way to the brush itself only to find it whited out. Grrr. Can you help? There are so many interesting sounding brushes I would love to explore using, and it seems absurd that Corel would design such brushes and extras and release them to the public if it wasn’t possible to actually use them. Let’s see if we can work our way through your questions. Let’s talk about the Extras in General. My Painter 12 installation DVD has the option to install the Painter Extras, but I have a PC, so I am not sure what happens with the Mac version. In any event, it isn’t necessary to go through that step. If you have your Extras on your desktop or copied to a folder in your finder you are good to go. Before we get to brushes, let’s talk about installing media stuff, like gradients, papers, patterns, etc. For this example we will install paper, and the process will work the same for any of the other media stuff. 2. At the top right corner of the paper library, you will see an option button, click it. 3. From the list that opens, select Import Legacy Paper Library. 4. A window will open. Navigate to where your extras are and go to Papers and select the paper library you want to import and click open. The paper library will be installed. With any of the media type libraries in Painter Extras, always use import legacy library. You copied the folder called Calligraphic Brushes, which contained three other folders and three jpgs. Then you pasted the Calligraphic Brushes folder at the end of this path: Applications > Corel Painter 12 > Brushes >. Is that correct? IF so, then you want to close Painter if it was open when you pasted the folder and reopen. Then click on your Brush Selector to open the Brush library panel. At the top right corner of the Brush Library Panel, click on the option button. Look down the list and click on Brush Library. The brush library list that opens should contain Calligraphic Brushes. Select it, and the Calligraphic Brush library will open. Select the variant you want and begin painting. I would have offered a different way to install the brushes, but if you did the above, it should have worked. You may have not realized that you were making a library and just looked for the brushes in Painter’s default library…and the brushes would not be there. Read over what I have said. Look for the Calligraphic library. And then let me know what you found. If it still isn’t working, then I’ll offer an alternative method. Success! Your solutions worked flawlessly. My error with the brushes was copying the Painter Extras “Brushes” folder with only the “Calligraphic Brushes” inside it into the Painter 12’s main brush folder. Seems so obvious now. So, thank you kindly for your spot-on and personalized tech support. I know now to consult your blog first with any questions. Happy to help and am glad that you are able to get the extra content working. The alternative method, and the one I would suggest using in the future, can be found in this video. Check it out…it is a very easy way to work. Thanks again for all the help. I looked at the video and will consider it in the future if I acquire brushes from a third party. For now, I’ve got plenty to work with and integrate, being a first-year Painter user. I’m having trouble making new Brush Libraries and moving existing libraries into the new library. I’ve added your Buttery Oils to painter. It shows up under Painter 12 Brushes. When I open C drive and go to Painter 12, Brushes and Painter 12 Brushes to move them it isn’t there. I can show you screen shots but don’t know how to send them to you. Please let me know what to do. If I haven’t sent good info please let me know. I just made a rather long reply and something happened and my reply disappeared. It was either my darn stubby fingers or Maggie, my cat, when she jumped on my keyboard. You can’t find the brushes in the C drive under Program files because Painter doesn’t install them there. The Program Files area is read only to Painter, so any custom stuff added to painter will be installed in the User area. But, who cares…there is no need to go into the guts of Painter anymore. When you installed Buttery Oils, you were using Buttery Oils.brushcategory, right. Buttery Oils.brushcategory installs into the currently active library. So if you Painter 12 library was open at the time you installed buttery oils.brushcategory, they would go automatically into the Painter 12 Library. To remove Buttery Oils from Painter 12 library, just go to your Brush Selector and open the Brush Library Panel. Now look down the list of categories until you see Buttery Oils. Right click Buttery oils and select Remove category. That will permanently remove Buttery Oils from your Painter 12 Library. On my blog, each brush set is provided with two possible downloads. One is Buttery Oils.brushcategory and the other would be Buttery Oils.brushlibrary. Download Buttery Oils.brushlibrary and save it somewhere on your computer…on the desktop would be good. Now from inside Painter 12 or X3 for that matter, go to Brushes > Import > Brush Library and select it. When the window opens, navigate to where you saved Buttery Oils.brushlibrary and select it. Click open and a new library will be installed called Buttery Oils with one category…Buttery Oils…in it. Now you can add more categories to Buttery Oils library by keeping it active and importing files that are brushcategory files. Or you can add a library with each brush set using my brushlibrary files. Thanks so much Skip. Your instructions worked great. I’m sorry I haven’t replied earlier. My wife and I own an art gallery in Poulsbo, Washington and I am very busy working and doing my art work. My art is wood working but I am really interested in digital art. We have one digital artist in our gallery who uses Photoshop and does great work. I know you say you don’t sell your work but I would be very interested in selling your work in our gallery. I really love what you do. Let me know if you’re interested?. Our gallery web site is http://www.libertybaygallery.com. I’ve tried to download some of Karen Bonaker’s brushes, which are brush categories. How do I create a new library in Painter 12? I love woodworking…actually all the crafts. I’m an old potter and was very active in my craft until a bad back started working against me. I was a member of the Craftsman’s Guild of Mississippi and was even the director for a year before I moved to Georgia. My favorite woodworker is Fletcher Cox…he is the real deal, and I consider him a good friend even though I haven’t seen him in years. I have fond memories of all my craftsmen friends…I love the crafts community. Don’t get me started, I will talk your ear off about the crafts. But, today, the topic is digital art, and you need to know how to make a library. I have done the following on a PC, and it works fine; it should also work on a Mac, but I haven’t tested it. 2. Pick one of the categories and change the name of the file from Karen’ Cool Colors.brushcategory to Karen’s Brushes.brushlibrary. 3. In Painter 12.1 or later, go to Brushes > Import > Brush library and navigate to where you have Karen’s brushes and select Karen’s Brushes.brushlibrary and click open. 4. The library will be installed with one category…Karen’s Cool Colors. 5. At this point you can go to Brushes > Import > categories and import the rest of the brushes into the library called Karen’s Cool Colors. I have watched this video but I don’t see where my issue is covered. I bought a book called Advanced Painter Techniques and he has brushes to download and install in painter x3. I have installed some of your brushes into painter x3 no problem. His brushes I downloaded into a folder on my computer. I then tried to install them in the same way I did your floral brushes but when I go to the folder I cannot see his brushes in the folder, I can see yours. Do you have any idea why I cannot see the brushes when I am trying to import them. I have Don’s book, too. When I download his book brushes the file look like this: Book brushes.zip. My brush file looks like this: HOS 2013 Florals.brushcategory. You can’t install the files with a zip extension the same way that you install a file with an extension of brushcategory. That is why you cannot see the brushes. Try looking at the Brush installation tips video. I think it will help solve your problem. Yippee…so glad you are all good to go now! Thank you for all your great tutorials and brush downloads. Did you ever come up with a watercolor brush cross reference for the brushes you used in your tutorials vs the brushes you made available for downloading? Hi Aaron, this is a great suggestion; you are not the first person to suggest it. I do not have the cross reference for the watercolor brushes so that you can follow along, but there are only a couple of videos that do not have a link to download the brushes that I am using. I would make the cross reference if I could, but when I made the blog post, the brushes were still in the raw state with different names. When I finalized the set, I changed the names and now do not remember which new brush name matches the old brush name. Going forward, I will make sure that you know what brushes I am using. Sorry for the problem. I didn’t realize it was a problem until it was pointed out. Why don’t my custom brushes work ? Using Corel Painter X3 on mac. Try reading the PDF on this link. What you did simply doesn’t work. I believe if you will take the time to read this PDF it will help you. It is talking about Painter 12.1, but the process is the same for Painter X3. Hope this helps. Brush Management. I would like to thank you very very much for your kindness, and all the knowledge that you share. Thanks to you, my start with Painter 2015 is much easier. There are not a lot of people who share without asking anything in return (especially money). It means that you are a true artist, with an artist spirit. It’s rarer and rarer in the world of today. So thank you again from the bottom of my (he)art and excuse me for my bad english because I’m French. I really appreciate your kind comment and I am so happy that my posts have been helpful. I have upgraded to Painter 2015. I have been using Painter since Painter 4. I have created a custom pallet in Painter X3 using some X3 brushes and 12 brushes. – In painter 2015 after I have imported my custom pallet and opened it up – when I click on a brush to use it a notice pops up which reads, “The specified brush library “Painter 12 brushes” could not be opened. I have searched forums and manuals – I have reinstalled, reset and updated my Painter 2015 and I cannot use my brushes that I’ve created in X3. An email from a tech at corel sent me the link to your video. Also in your video you show how to go into brush library folders and move things around – however – you do not show how to make a brush folder. Do you have to go into your computer drive C: – then click on Programs – then click on Painter 2015 – then brushes – to make a new library folder? If yes, after you do that – how do you save the brush you are working on to that folder? When I like a brush I usually save it to a custom pallet – when I click on save variant – I seem to only have a choice to copy variant and create a new category in the library. I cannot seem to create a new library from the program itself and save a brush to it. Thank you in advance for help with this. I have to say I am surprised that a tech from Corel sent you a link to my videos. He should have helped you; that is really sad that he didn’t. Not to worry, I can help. The reason that your custom palette cannot find “Painter 12 Brushes” is because the name has been changed to “Painter 12/X3 Brushes.” A custom palette doesn’t save brushes or any objects, papers, flow maps, commands…it saves the location of the brush, paper, flow map, etc. Painter 2015 was a major upgrade from Painter 12.2 and X3. A lot of code had to be re-written to make the program 64 bit compatible for Macs. So, some of the nomenclature also got changed. Usually, you could just import your workspace from an earlier version and all would be the same. That isn’t the case with Painter 2015 because it is very different than earlier versions. We don’t see the difference, but it is there. So what do you need to do? Unfortunately, the best way to handle the situation is to rebuild your custom palettes. Which you can do by going to the Brush Selector > Brush Library Panel > and click on the option button in the upper right hand corner of the Brush Library Panel. That will open a list and you will want to scroll down to Brush Library and click that. Another list will open, click on Painter 12/X3 Brushes. That will open the Painter 12/X3 brush library. Now you can go to the specific brushes that you used in X3 and 12.2 and drag them into a custom palette. I must say, though, that is a long about way to get to 12/X3 brushes. The same brushes with the same names are located in the same categories in the default Painter 2015 Brushes. Just create a palette to those brushes in Painter 2015; it will be best in the long run. Of course this is for default brushes only. But, you mentioned that you have custom brushes that you created in X3 that you cannot use in Painter 2015. That isn’t the case Marguerita. You can use brushes that you created in Painter 12 or X3 in Painter 2015, but you have to be able to get to them. They are not located in Painter 2015, you have to export them from X3 or 12.2 and then import them into Painter 2015. But to do that, the brushes had to be saved in Painter 12.2 or X3. Placing them on a custom palette doesn’t save them permanently. They remain the way you left them last. In other words, when you place the brush on the custom palette, it is just information about where the brush is located. The actual makeup of the brush changes every time you tweak it…or if you go from one library to another, when you come back the brush is reset. But, if when you changed the brush, you went to Brushes > Save Variant and saved the variant with the same name or a new name, then you have captured the brush permanently and you can export it and import it into Painter 2015. If per chance, you saved the brush into a new category, then that is even better. You can export the new category with all the saved brushes and import them into Painter 2015. But, please understand, I am talking about a new category. If you saved the brush into one of the default categories then you cannot export that category and import it into Painter 2015 without causing problems. In other words, let say you changed an acrylic brush and then saved it to the default Acrylic Category in Painter X3. You do not want to export the Acrylic Category and import it into Painter 2015. So…if you made a new category in Painter X3 or 12.2 this is what you do. Go to the menu item Brushes > Export > Category. A Choose Brush Category will open. Select the category you want to export and click OK. An Export Brush Category window will open, just navigate to some place on your computer that you will remember…like your desktop or some folder you create for the exports. Once you have found the place, then click save. A file will be saved with an extension .brushcategory. Now to import the category into Painter 2015, you open Painter 2015 and go to the Menu item Brushes > Import > Category. An Import Brush Category Window will open, navigate to where you saved the category, select it, and click on Open. It will automatically load in the currently active Library. If you didn’t save a category, then you must export each brush. To do that you go to Painter X3 or 12.2 and select the brush. Go to the Menu item Brushes > Export > Brush and an Export Brush Window will open. Navigate to where you want to save the brush and click save. A file will be created with an extension of .brushvariant. Now open Painter 2015 and go to Brushes > Import > Brush. An Import Brush Window will open; navigate to where you save the brush and click open. A Save Variant window will open. This is important. At this point you want to click on the plus sign and create a new category. Once you have done that, then select that category and save the variant into it. Then import the rest of the brushes one at a time into your new category. If you want to make a new Library, there isn’t a way to do that automatically in Painter. You can do it by going into the files and manipulating stuff, but I wouldn’t recommend doing that. Here is an easier way. Go to the top of the page of my Blog and click on Bristly Dab Download. That will open the page with the Bristly Dab Download. Near the bottom of the post you will see Bristly Dab Library. Click on it and download the library to some place on your computer that you will remember. The desktop is a good place. Now, I would go to that file and right click it, which will give you an opportunity to rename the file…at least in Windows. If you are on a Mac, I am not sure how you rename a file. Anyway, the file name will be Bristly Dabs.brushlibrary. You want to change the Bristly Dab part to say…Marguerita.brushlibrary. Now open Painter 2015 and go to Brushes > Import > Brush Library. An Import Brush Library window will open. Navigate to where you have saved Marguerita.brushlibrary. Click on it and select open. Marguerita library will automatically install into Painter 2015. It will have one category in it: Bristly Dabs. Now you have your library. If you want to import your brush variants or brush categories into that library, you simply make sure you are in that library when you do your importing. The categories will automatically install into the currently active library. And if you are installing a brush variant, then you will follow my directions above and install into an existing category or a new category that you create. Finally, if you wish, you can click on the brush selector and then right click on Bristly Dabs and select remove category and it will be removed leaving all of your newly imported categories. Thank you from the bottom of my heart for your help and information. I could have painted about five paintings in the amount of time I tried to move my brushes over. Here is what I ended up doing: In my painter X3 – I created a new “category” in a brush library, then I went brush by brush in my custom pallets that I am so attached to and “copied the variant” into the brush library category that I created. Then I exported the category into a document folder like you suggested – then in Painter 15 – I imported the category into the existing library. Viola`!! I have my favorite brushes and variants that I can then make a new custom pallet with. Wow thank you. And through all my researching today, I discovered the “Looks Pallet” – where you can save a brush variant, flow map along with different paper textures. So now I’m on a roll and back on track. I’m so glad I was able to help, but still disappointed in Corel Tech support. But the good news…you are up and painting!!! I am pretty sure there is a way to combine libraries, but it is complicated and I wouldn’t recommend it to anyone who isn’t very computer literate. There is no way using Painter’s brush management system. If by it kind of freezes, you mean that it is slow to change libraries, then you need to make more libraries, not consolidate all of them into one library. When Painter opens a library, it has to open the complete contents into your memory and hold it there. So, if you library is very large, then it will be slower loading into memory. For instance, if you take the default library and add a lot of custom categories, it will become quite large and use up your memory. The solution is to not add any custom categories to the default library and create many more libraries with few categories in each one. That will allow switching between libraries to happen faster. Also, if you have a large library opened in memory, other functions like brush strokes will be slower. Another solution, add more memory. In my opinion, Painter works best with 16 or more gigs of memory. If you have that much memory, then you may need to update your processor. For Painter, you will want the fastest processor you can afford. But, before doing any of this, try adding more libraries that contain fewer categories. Hi Skip — do you have an updated guide to installing brush libraries for Painter 2016 by any chance….? Figured it can’t hurt to ask… Didn’t see one on the site so if I missed it, please point me in the right direction! Thanks again for all that you do and share!! I haven’t updated the guide to installing brush libraries, but it hasn’t changed from the directions for version 12.1, so what is posted is still good. However, it has more information than you need because I was explaining how to install for earlier versions, too. I have told myself to update the information bunches of times, but I just don’t seem to listen to myself. I do hope to do it soon. I am not sure I am understanding what you are doing. To drag a brush to an existing palette, you hold down the shift key and drag the variant to the opened custom palette in Painter X3 or Painter 2016. Is that what you are doing? Having started painter at Painter 2015 I’m unfamiliar with the sort of libraries you have for download and do not have a previous program like Painter X or Painter 12 to load them in prior to converting them to Painter 15/16/17 format. If I hover over the links which say Brush Category or library I get a link which suggests the file will end in .brushcategory etc. However, when I actually click the link what actually downloads is a zip file which contains a .jpg, an Ordering.dat file and a folder filled with a variety of files, none of which end in .brushcategory or .brushlibrary. I mean I managed to get them but I needed to change to a different browser to do it. I understand now. Your computer or browser is unzipping the files when you download. The extensions .brushcategory, .brushlibrary, .brushvariant are actually zip files. If you will google “How do I stop my computer from unzipping files,” or something similar, you should find a solution. I think the solution is browser specific and I also believe that it only happens on Macs, but I am not sure about that. Hope this helps. Hello…hmmm…a simple explanation…that is tough to do. But, I’ll give it a try. Thank of an image hose as similar to a water hose, but instead of spewing out water, it spews out images. The image is determined by the nozzle. You might think of the nozzle as something that determines the shape that the hose spews. OK…so what is rank. Rank determines what happens to the image. For instance, an image, lets say an arrow, when it lands on the canvas…it could be pointed up, to the right, to the left, down…or in between the directions I mentioned. the Help Files calls those positions the angle of the image. OK…so it the image hose sprays out the image and the only changes that happen are changes to the angle of the image, then we are working only with rank 1. But, lets say we want the image to not only change its angle, but we want it to change its size, too. If two things can change as the object is sprayed out of the nozzle, then we are working with rank 2. Add a third dimension…lets say color…and we are working with rank 3. OK…so rank 1, 2, and 3 just determines how many changes can happen to the image. It gets a little more complex than that, when you realize that the image hose variant in the Image Hose Brush Control Panel…Window > Brush Control Panels > Image Hose can be set to use Rank 1, 2, or 3…or a combination of them. So if I want to spray an image that changes rotation, size, and color, I would set the Image Hose brush control panel to use all three ranks and I would set the expression of all three ranks. OK…so now the variant can take the image and spray it with three different properties. But…hold on…the image hose alone cannot determine how many ranks are used. The nozzle has to have three ranks as well. For instance, most of the nozzles available will not change angle and color…so if you set the hose up to use 2 ranks, it will not, because the nozzle doesn’t have two ranks to use. What that means is that when you make a custom nozzle, you will take the image you want to use, and manipulate its rotation, size and color for a rank 3 nozzle. I am not going to get into how to make a nozzle, but if the nozzle is made only with one change, then it will always paint as rank 1, regardless of how the image hose is set. Conversely, if the nozzle can paint 3 ranks, but the image hose is set to use only one rank, then it will paint only with one rank…or one change. Reading over this…I don’t think I made the explanation simple. I think I failed miserably…sigh. Basically, an image hose sprays out images. It sprays a rank 1 image if only one property of the image changes…a rank 2 if two properties change…and a rank 3 if you have three property changes. Now if you question was more about how to use and make nozzles…that is a lot more complex. I would have to do a couple of videos to demonstrate it. I hope this helps. I think this is a more appropriate place for my question. So here it is again. Sorry for the duplication. You can delete the other one and answer it here. Do all your brushes on these download pages work for Painter 2017? BTW, I have no experience with Painter and haven’t even used it yet. Never used a Wacom tablet, either. I only have 15 years experience with Photoshop. I plan to enroll in your classes next month in August 2017. Too busy and no money this month. Sorry for the late reply. I have had some personal issues that have been taking my time and I haven’t been very attentive to the blog. Are you still using Painter 2016 or is it a different version of Painter? If still in 2016 and you are using a PC, then you could try doing a repair on Painter and see if that helps. To really be able to help, I need to know the version of Painter you are using, your operating system, if you are using a custom layout, if you are using a custom workspace. Then I will try to sort it out. I’m hoping you have found your answer by now…again so sorry for the late reply. By the way I didnt answer your question, I have painter 2016 and imac with the latest sierra version 10.12.6 I dont change my brush icons ofen so its not a bother.